For this edition, though I am not culinary expert, let me share about one uniqueness of Indonesia from the closest thing. As I cannot go anywhere right now. Hahahahaha…This one is Mie Ongklok of Wonosobo. Wonosobo is a regency located 120 km south westernward of Semarang, Central Java and covers Dieng Plateau as well. 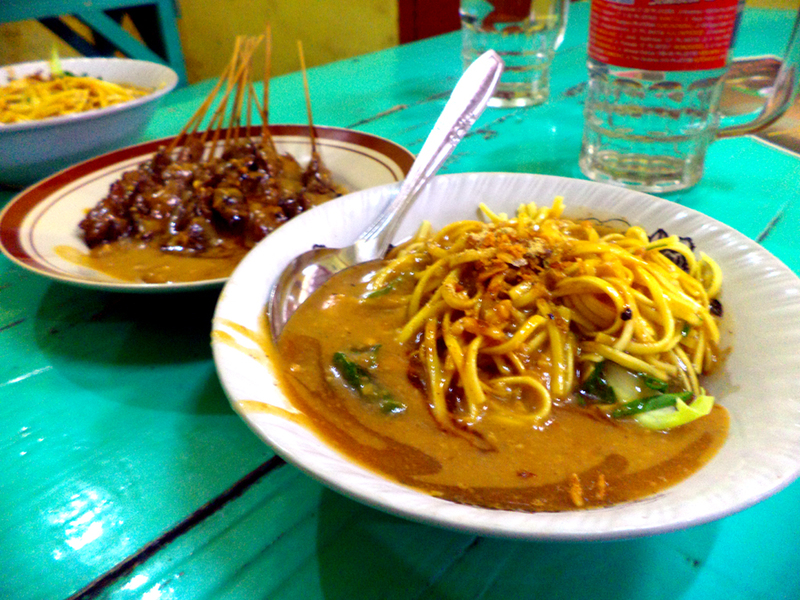 Besides Mushroom satay, Wonosobo is famous of its Mie Ongklok. Even though noodles is originally from China, but it has spread and modified in accordance to local tastes. One of them is Mie Ongklok. Ongklok itself means a small woven bamboo basket which is used for noodles’ cooking process. Mie Ongklok typically uses shredded cabbage, chives, and sticky sweet broth called Loh. If you want to get spicier taste, just add some chopped chili in it. If I go to Wonosobo, I always eat this noodles as it is typical and cannot be found in other places. I cannot find Mie ongklok stall in Semarang, but I don’t know in other places. But the best thing is enjoying it in the original place, with cool climate and relatively peaceful place. It’s so wonderful. Mie Ongklok can be enjoyed with beef satay and tempe kemul (a kind of fritter tempeh) as those are optional. In every Mie Ongklok stalls (particularly in Wonosobo and surroundings), tempe kemul and beef satay are available, and it is economical for everyone’s budget. For one portion of Mie Ongklok, just pay around IDR 6,000 and more if you want to add tempe kemul (IDR 500) and beef satay (I forget how much it is). It tastes between sweet (as most Central Javanese cuisine tend to be sweet), and savory at the same time. You can find it everywhere in Wonosobo, but most people prefer to have it at two places : Mie Ongklok Longkrang and Mie Ongklok Bu Umi. Let me tell you later about it. This is one of Indonesian culinary richness..
Iki aku wis pernah maem, pas neng daerah Dieng. pas panas-panas le maem…. Mak Nyoooos! Aku wis bolak-balik..nek nang Wonosobo mesti golek. Cobain deh…belum tentu di Jakarta ada. Beda teh…Soto gak sekental itu. Boleh juga…saya pas ke Wonosobo juga buka puasa pake itu.